I always start a painting with sketching what I want on paper first. I wanted to stay within a the style of my previous Zombuki paintings, so I brought up a pic of them while I sketched Kimi. Kimi’s ruffled collar was changed 1/2 way through the painting process, as I thought a tight vertical collar would work better than a big swooshy one. 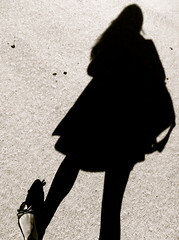 And of course there is the real Kimi below (photo by Brigitte)! I took a moment to snap a pic of Kimi in progress on the left, and her completed on the right. Today RAWR, my 4 inch KidRobot Mini Bub custom is for sale in my shop at emilybee.bigcartel.com! Rawr was originally made for the group show “Beware Tall Grass” at KidRobot London in November 2011. 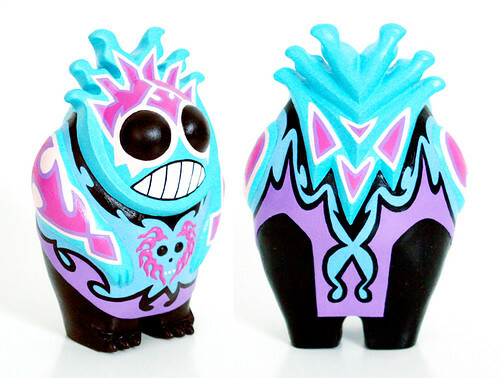 TWO OF SPADES, my 6 inch Mighty Muggs custom is for sale in my shop at emilybee.bigcartel.com! Two of Spades was originally made for a group show at Labyrinth Books in 2009. He is very special because he was the second custom that I’ve made! Two of Spades is a Card Soldier who works for the Queen of Spades in Wonderland. If you thought the Queen of Hearts was nasty, you’re in for a surprise! Like the Hearts, the Spade clan is also known for beheading, except they don’t play a game of hedgehog croquet with flamingo mallets to pass the time before killing you, they just simply behead you on the spot. This Two is particularly deadly, and gets called for execution duty quite frequently since he is “good at it” (whatever that means… ask the Queen of Spades, that’s what she said!). When he’s not beheading prisoners, he tends to his small 2 x 2 garden plot that is filled with the most beautiful and fragrant purple roses. Who knew Two had a sensitive side! Today I </3 U ALWAYS, my 4 inch KidRobot Mini Munny custom is for sale in my shop at emilybee.bigcartel.com! I </3 U Always was originally made for my two-person exhibit "Fantastic Heroes" at The Trace Gallery in December 2011. The roses on this piece were inspired by traditional Sailor Jerry-esque rose tattoos, as roses symbolize love + tattoos are forever. Roses are beautiful, yet have thorns that hurt. Tattoos are also beautiful, yet hurt to get done. Sometimes beauty + pain go hand in hand. Today I am offering GOODBYE, my 4 inch KidRobot Mini Munny custom for sale in my shop at emilybee.bigcartel.com! Goodbye was originally made for my two-person exhibit “Fantastic Heroes” at The Trace Gallery in December 2011. He was made with his mate ‘Hello’ (who has already sold, but you can see them both here). We casually say Hello + Goodbye to each other everyday. But what happens when we say it to someone we love? What if we never see them again? I thought about the anguish of that situation, and wanted to express the concept with two separate pieces. Goodbye has been painted in blues and purples to further enhance the sadness that he represents. ‘Black Cherry’ was inspired by the Goldfrapp song with the same name.